FAIRFIELD — Steven Bartlett has grown up seeing some scary things. 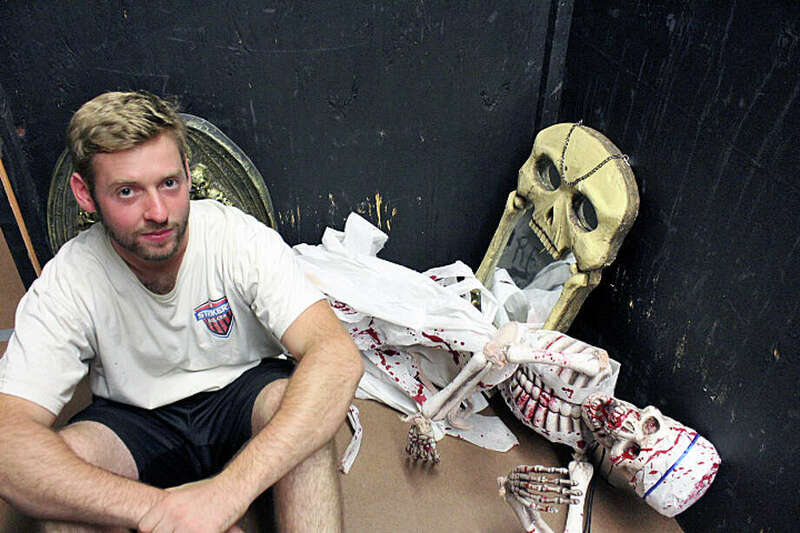 It was a family tradition for a haunted house to appear at his home every October, so it’s not surprising the young Bartlett has embraced the macabre, starting up his own business creating Halloween props, and directing the crews erecting the “Fairfield Fright Nights” spectacular at the teen center on Old Dam Road. As the founder of “Prop Shop Productions” Bartlett does everything from building props to building Halloween attractions, like Fairfield Fright Nights. After starting out building makeshift props as a kid with stuff lying around the house, Bartlett said he’s learned more and more over the years, and now makes fully animated pneumatic props. To help with that, Bartlett, 20, is taking welding courses at Naugatuck Valley Community College. His props, he said, are made of steel and need to be welded for durability. The spooky tour at the teen center is a fundraiser for several organizations and was first held last year through a collaboration between firefighters, Public Works and Parks and Recreation. The $10 admission benefits the Fairfield Firefighters Foundation. Hours: Fridays and Saturdays, 7 - 10 p.m. Sundays 6 - 9 p.m.
Bartlett took some time out from preparing to scare to answer some questions. Q: What sparked your interest in going all out on Halloween? A: My dad started the Halloween tradition in 1989 and for 25 years did a home haunt for the neighborhood. At a very young age, as young as I can remember, I started getting involved, and as I grew up found that Halloween is really my passion. That’s why I started my company, Prop Shop Productions, LLC, so that Halloween could be a year-round thing. Q: How do you come up with the layout of the haunted house and the different components? I try to come up with all original ideas for the haunted house, playing on peoples’ phobias and senses. I start coming up with the new layout in November and spend the year making new props and improvements to make the next year even better. Q: Have you ever had to tone anything down? A: When we scare someone to the point of crying is usually when we tone it down a little, or if we see a younger kid that is really scared, we will start to tone it down a little. But for the most part, I want to give you the best/scariest haunted house experience I can. After all, you did come to get scared. We’ve had a few incidents of people peeing their pants over the years. Q:What kind of reaction did you get from the people who went through last year’s haunted house? A: The reactions of our “victims” last year were great; everyone loved it and said they will be returning, except for the few complaints we received of being too scary. At $10 per person its a great bang for your buck. We try to be affordable to families, while other haunts in the area are $20+ per person. A: I am actually terrified of spiders and snakes. I may love my giant 6-foot attack spider, but you’ll catch me running if I see a real spider.